A Survivor's Tale: How Hiroshima Shaped A Japanese-American Family : Parallels Kikue Takagi narrowly survived the atomic bomb that killed her classmates. Soon after she moved to California, where she worked for many years at Disneyland. Now in her 80s, she's back in Hiroshima. Kikue Takagi, left, narrowly survived the Hiroshima atomic bombing as a schoolgirl. She's now 83. Her second cousin is U.S. Rep. Mark Takano, a Democrat from southern California. His grandparents and parents were all placed in U.S. internment camps in World War II. 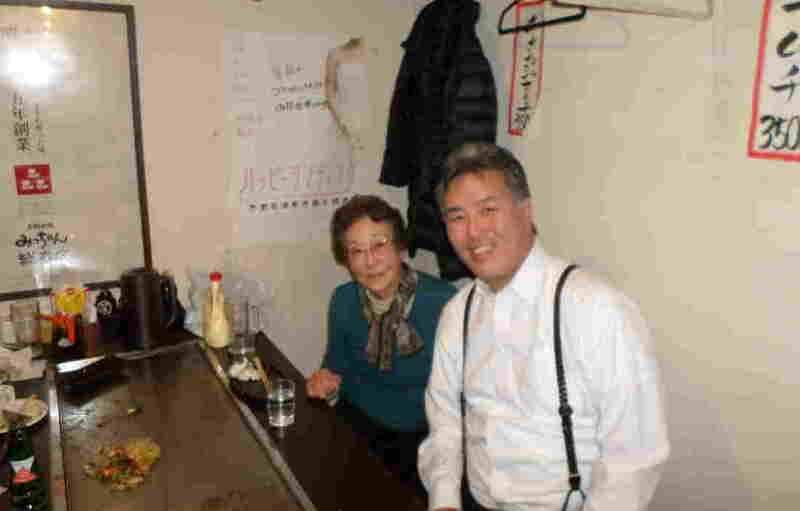 In this photo from last year, they are at a restaurant in Hiroshima, where he visited her. As the U.S. Army Air Corps prepared to unleash the world's first attack by an atomic bomb on Hiroshima on Aug. 6, 1945, Japanese schoolgirl Kikue Takagi, age 12, woke up feeling sick and stayed home that day. Her classmates were sent to Hiroshima's city center to clean up debris, doing their part in the war effort as Japan struggled to hold off the rapidly approaching U.S. military. Those students were near ground zero when the American bomb obliterated the city. At home on the outskirts of Hiroshima, Takagi was spared. "I saw a very bright light coming through our house," said Takagi, now 83. "A very strong wind blew away the windows and the door." Takagi is also the second cousin of U.S. Rep. Mark Takano, a California Democrat. Decades after the bombing, on a shared visit to Hiroshima's Peace Memorial Park, a solemn site that commemorates the bombing, Takagi told Takano about the horrors of that day. "You could not see the water of the river on the day the bomb exploded because so many dead bodies were floating in it," she told him. The devastation was total with an estimated 140,000 people killed, either the day of the bombing, or later from injury or radiation sickness. Takagi remembered details like the badly-burned survivors whose skin turned gray. In many cases, sliced cucumbers were the only means of treating the wounds. President Obama's visit to the Peace Memorial Park on Friday had special resonance for Takagi and Takano, with their ties to both the U.S. and Japan and an understanding of how Hiroshima shaped the relationship between two countries that have gone from bitter enemies to close allies. "The scientific revolution that led to the splitting of an atom requires a moral revolution as well," Obama said in his remarks. "That is why we come to this place." Takano listened to Obama's speech at NPR headquarters in Washington, connected to Takagi who was on the line from Hiroshima. "Only a few of my classmates survived," Takagi told NPR's Morning Edition as she recalled the bombing. "Most died instantly." 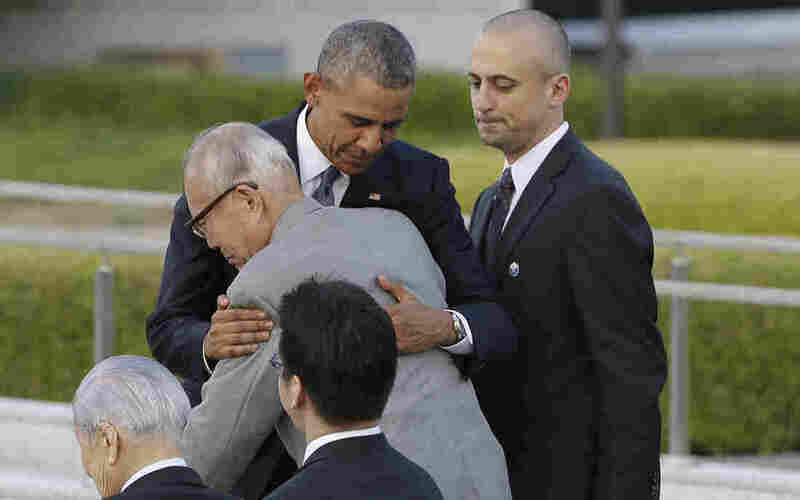 President Obama hugs Shigeaki Mori, an atomic bomb survivor and a creator of the memorial for American WWII POWs killed in Hiroshima, during a ceremony at Hiroshima Peace Memorial Park in Hiroshima on Friday. Obama became the first sitting U.S. president to visit the site of the world's first atomic bomb attack. After World War II ended with Japan's surrender, Takagi moved from her ruined city to southern California, where she had relatives who had faced their own hardships during the war. They included Takano's grandparents and parents, all of whom were placed in U.S. internment camps during the war, along with more than 100,000 other Japanese-Americans. (Takano was born in 1960). Takagi settled in Anaheim, Calif., and worked many years at Disneyland. Takano, after graduating from Harvard College, taught high school literature for more than 20 years in his hometown of Riverside, Calif. The two saw each other often, yet never spoke in depth about the Hiroshima bombing. But in 2002, they traveled together to Hiroshima to visit Takagi's aging mother. Takano also suggested a visit to Peace Memorial Park. When Takagi said she had never visited, Takano hesitated. "You don't have to go," Takano told her. "But she said, 'I'm ready to go.' That's when she began to talk, telling me stories about that day." As they explored the park, they found a tribute to middle-school teachers and a display of middle-school uniforms, poignant reminders for Takagi. "After that day, I felt every leader of a country with a nuclear arsenal should come here and see what a nuclear bomb could do," said Takano, 55, who's in his second term in Congress. A few years after their visit, Takagi moved back to Japan. Now 84, she lives outside Hiroshima. She remains in regular contact with Takano, who visited her there last year. One month after the atomic bomb was dropped on Hiroshima, a man stands amid ruins left by the explosion. The structure seen standing became the Hiroshima Peace Memorial, which President Obama visited Friday. When Obama traveled to Japan in 2009, the first year of his presidency, he promised to go to Hiroshima before he left office. Takano encouraged the president to visit, sending him a letter last month when there was speculation that Obama would make the stop during the Group of Seven summit in Japan. 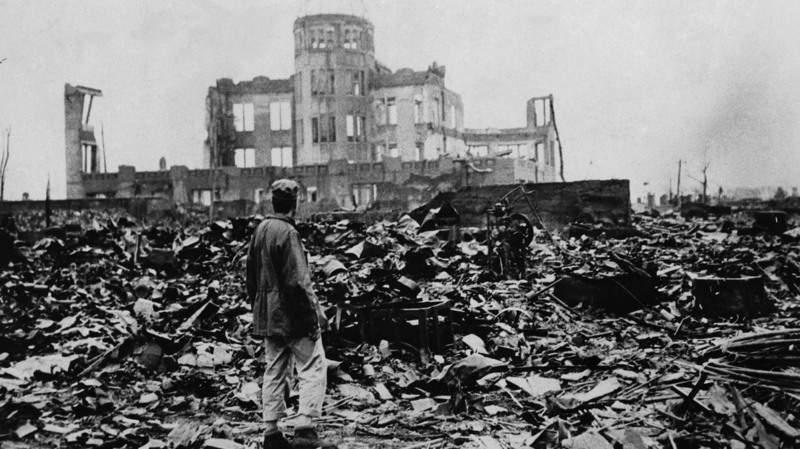 "A tour of Hiroshima is not an apology on America's behalf. Instead it is a signal that the commander-in-chief of the largest military in the world — and the commander of the world's largest arsenal of nuclear weapons — recognizes the awesomeness of their destructive power. It also sets a precedent for other world leaders to follow in your footsteps and feel the moral imperative to visit the city." In Japan and other countries, many scars of World War II have never fully healed and many disputes have never been resolved. Just last December, Japan and South Korea announced an agreement covering the thousands of Korean women who were forced into sexual slavery for Japanese troops during the war. Japan formally apologized and agreed to pay compensation. It marked a breakthrough, but relations between the countries are still fraught. Japan, meanwhile, still demands that Russia return four Kuril Islands that Moscow seized in August 1945 as Japan was reeling from the U.S. nuclear bombings in Hiroshima and Nagasaki. Russia and Japan have never signed a peace treaty and the islands were the focus of talks earlier this month between Japan's Prime Minister Shinzo Abe and Russian President Vladimir Putin when they met in Sochi, Russia. Takano described Obama's visit as an act of healing, and contrasted it with leaders who regularly exploit historical grievances. "I think it's incumbent on leaders to be very careful about these national narratives that overuse wounds of the past as a way to distract from the challenges they are facing today," said Takano. "What happened to the people of Hiroshima and Nagasaki is a worldwide touch point," he said. "I think the most significant thing for the current generation that is passing is knowing that today's leaders are making a serious effort to deal with the past."